So. This salsa. It’s really great! It’s also easy and can be made ahead of time, so what’s not to like? 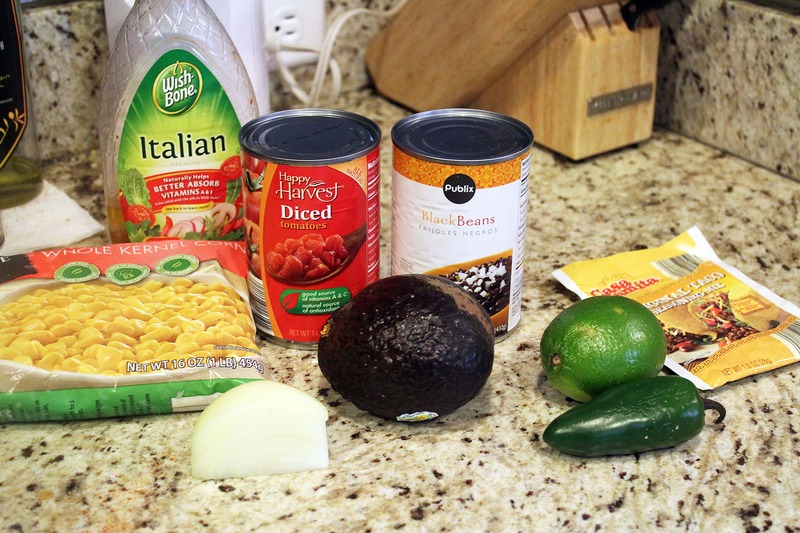 I love standard tomato salsa, or baked bean dip, but this has the best of both worlds – cool, spicy, creamy bits of avocado, and protein and fiber from the beans! 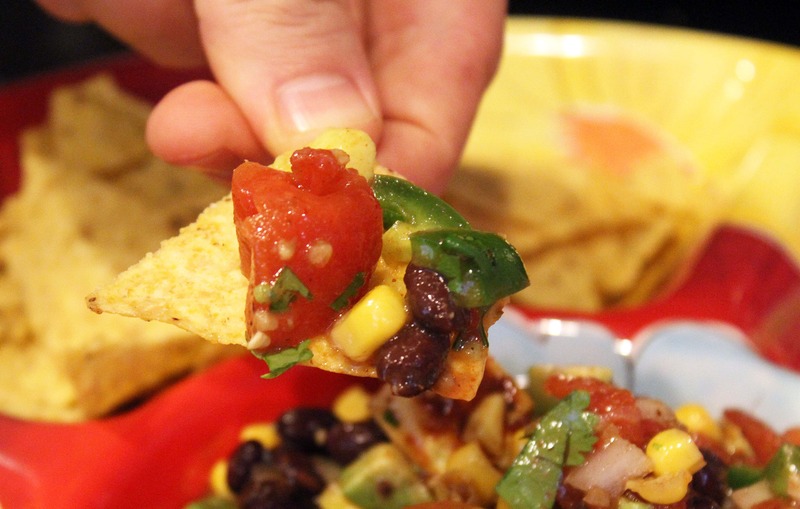 It totally makes it OK to eat half a bag of chips with it. Trust me. 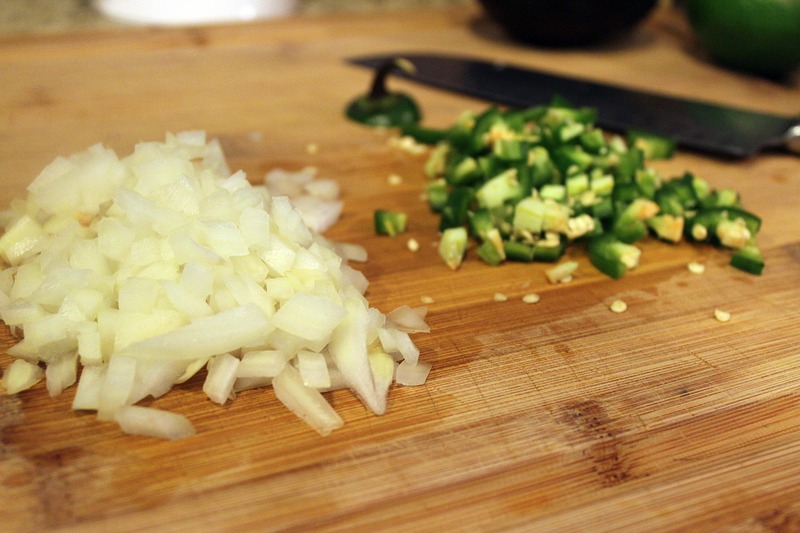 First, finely chop the onion and the jalapeno. You can leave the seeds in the jalapeno for lots of spice, or take them out if you prefer more mild things. It’s up to you! 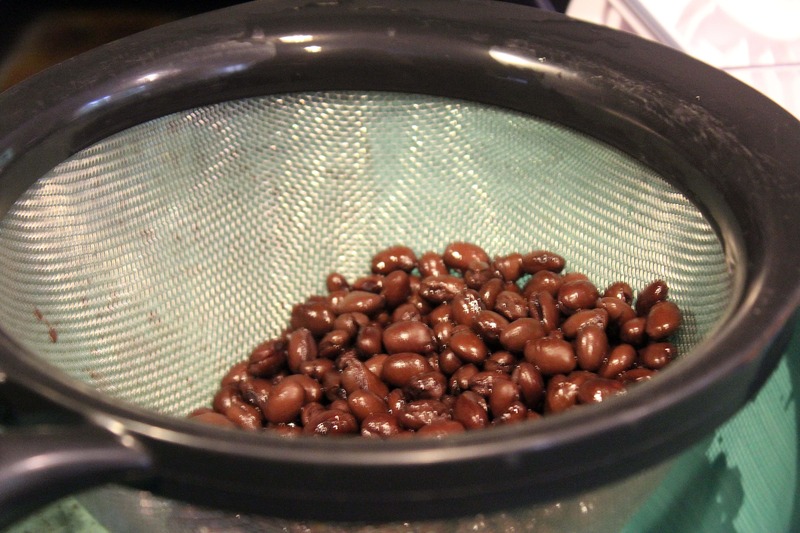 To make the salsa un-goopy, drain and rinse the black beans really well. 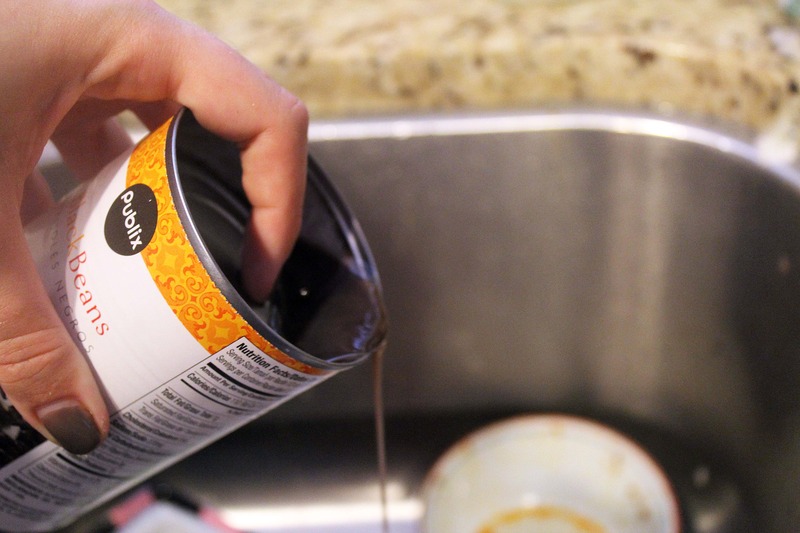 Drain the tomatoes too, but only by about half – some of the canned tomato juice is great! 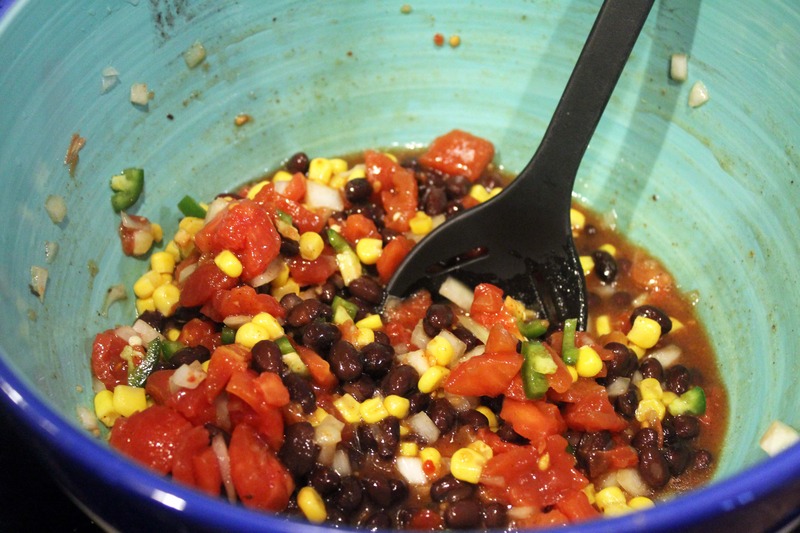 To a large bowl, add the beans, tomatoes, corn, onion, and jalapeno. 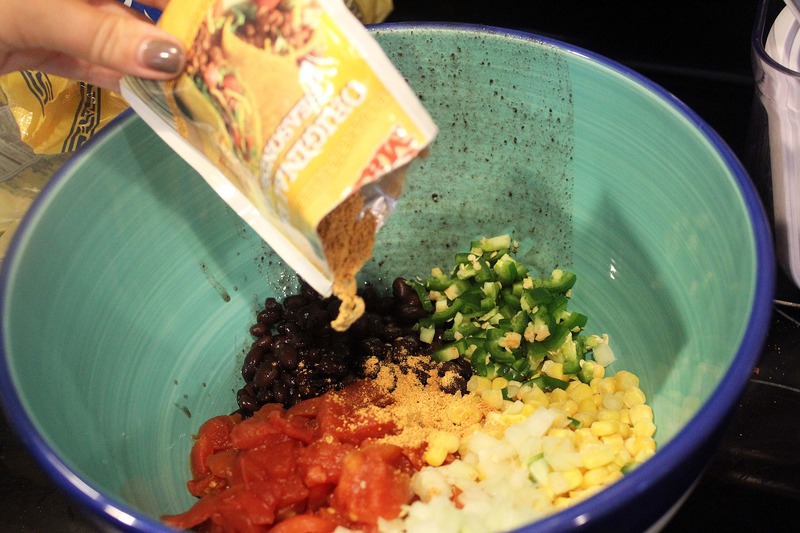 Dump in the taco seasoning. Then squeeze in the lime juice and add the salad dressing. This is a great use-up for dressings that ‘appear’ in your fridge and sit there for 6 years. 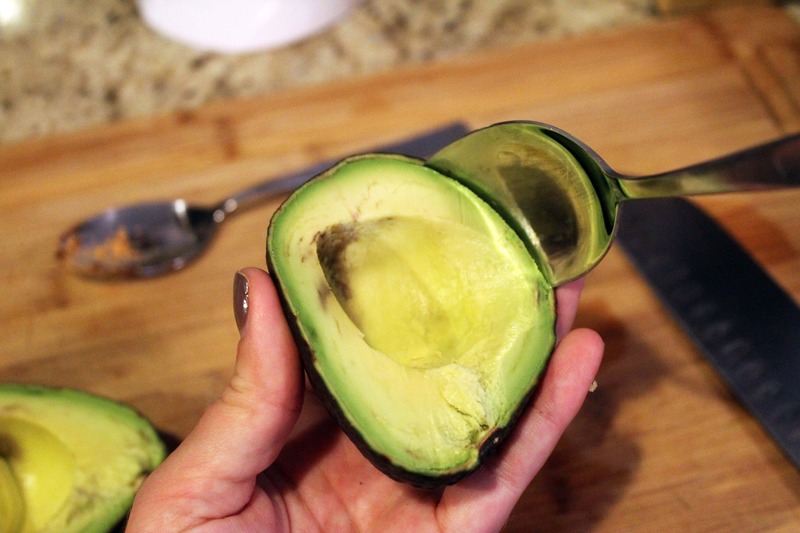 Sure, they might not go BAD, but that’s a spot that wine could go in so…I say get rid of the dressing. Stir all this together, and taste to see if you’d like to add any salt – I rarely do. 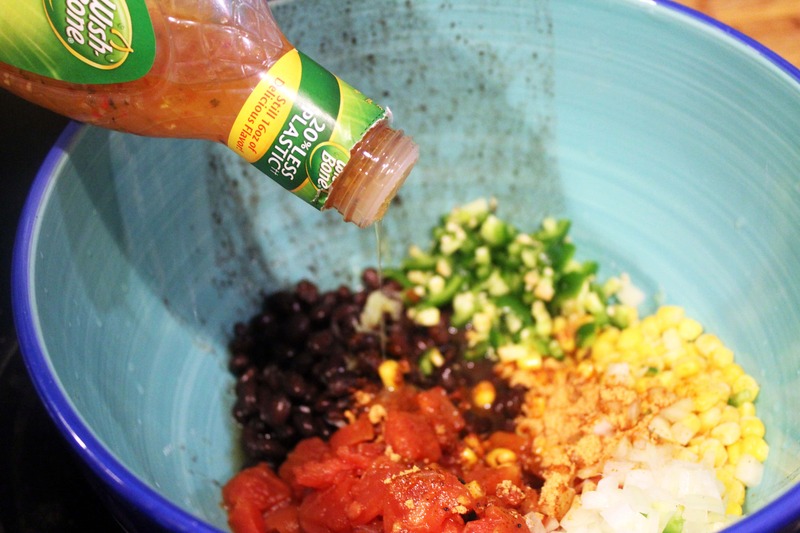 At this point, you can stop and save the salsa – just add the last two ingredients right before you’re ready to serve. 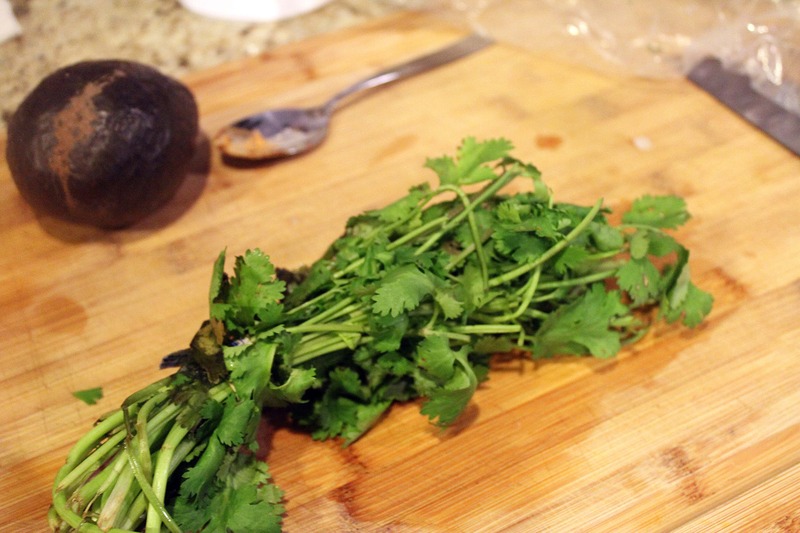 When you’re ready to serve the salsa, pick the leaves from the cilatro that’s been wilting in your fridge for a week. 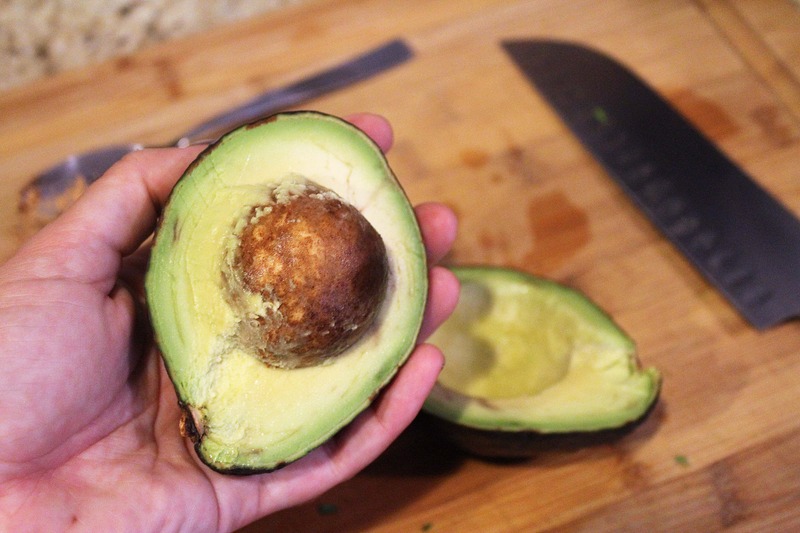 Then, cut the avocado in half and carefully remove the pit. 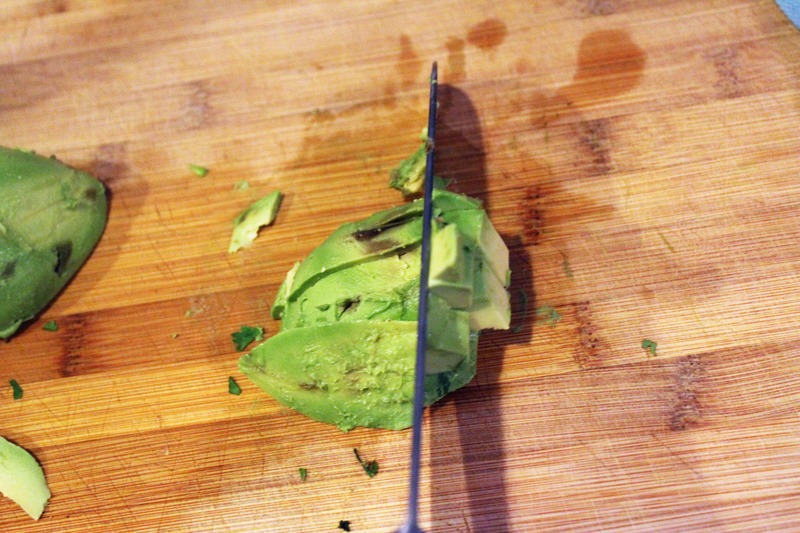 Scoop the flesh from the avocado peel…. ….and dice it gently into small cubes. 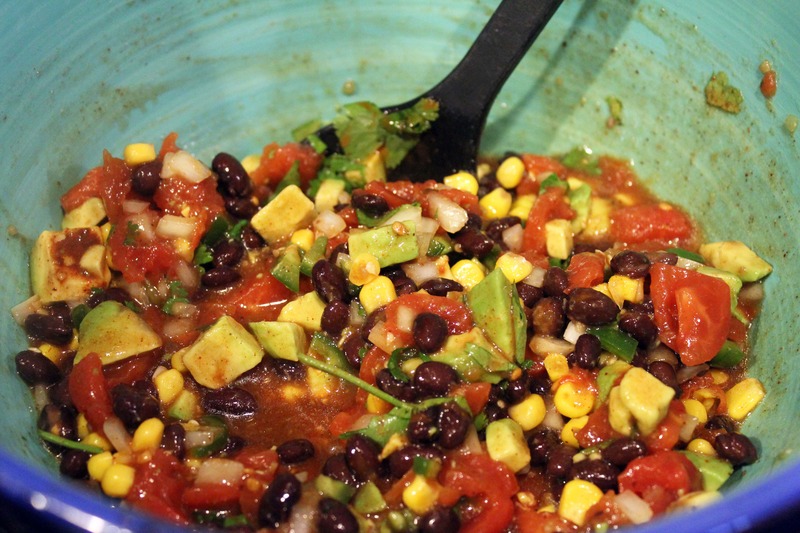 Add the cilantro and avocado to the salsa, and stir it together very gently. 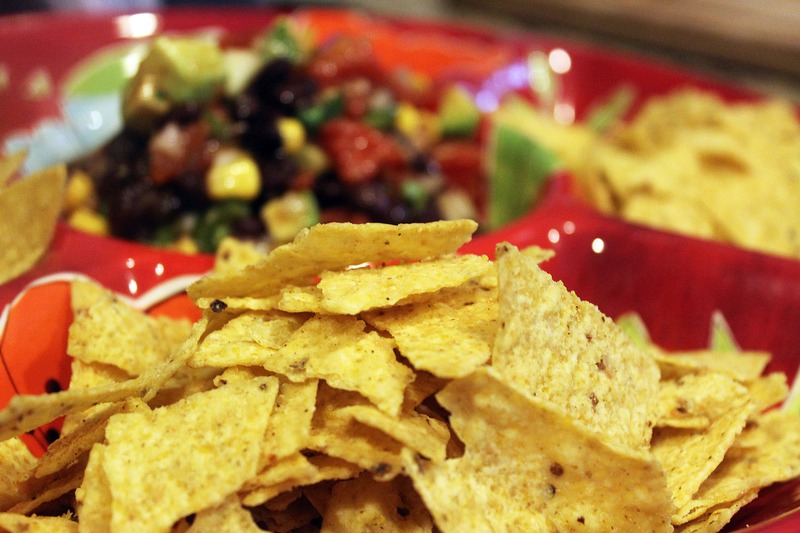 Naturally, this is lovely served with chips, but you could also serve it over lettuce with some shredded cheese for a fast Mexican-style salad – the dressing’s already in the salsa! 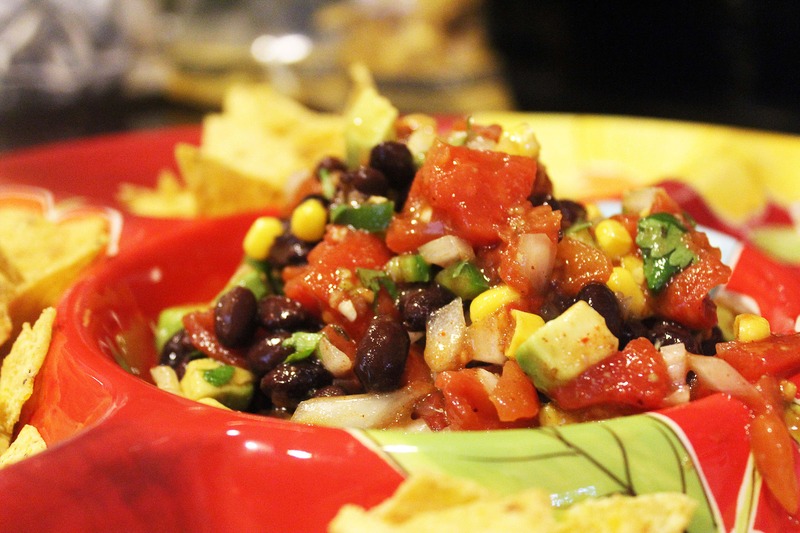 This is great for tailgaing, snacking, entertaining, or….Tuesday nights. Whatever. This is another Weekend Potluck submission – that fun thing that The Better Baker hosts along with Kim&Julie, Holly, Brandie, Tonya, and Tabitha each Friday. 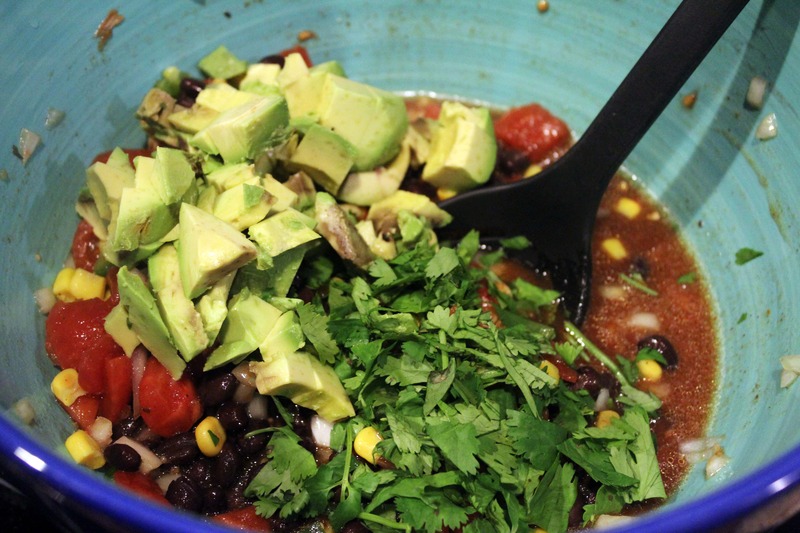 I love finding new recipes each week through this mashup! Previous Post: « Happy Happy Happy! 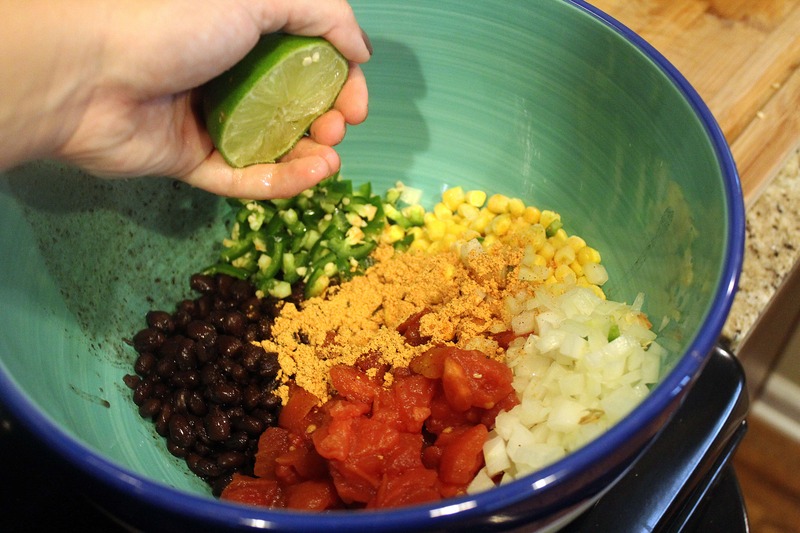 mmm the black bean salsa looks so delicious.